Positive: Powerful hardware; high performance; nice display. Negative: Relatively high price. Positive: Slim size; light weight; powerful hardware; stylish design. Negative: Relatively high price. 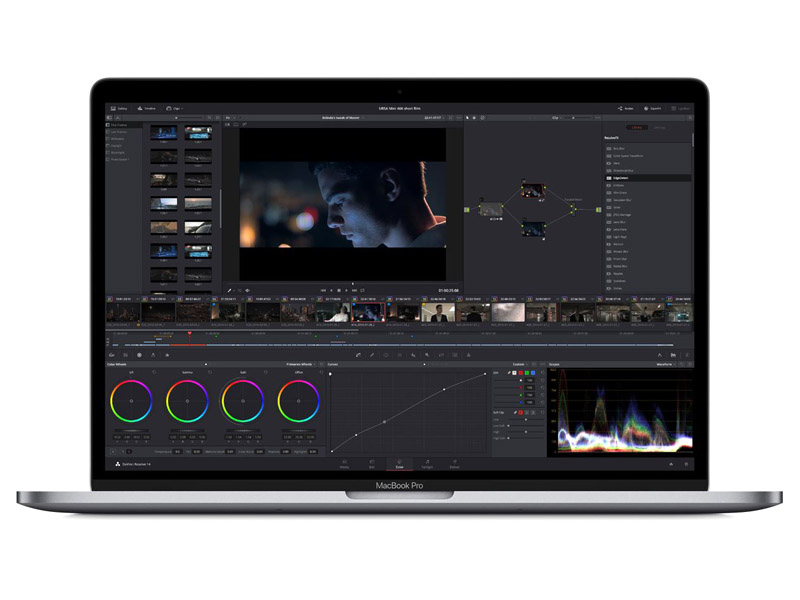 The Apple MacBook Pro 15 2018 is a powerful professional notebook with the brilliant design of its predecessor, aimed for business and professional power users. On the outside, the largest MacBook remains utterly unchanged. However, it is still 17 percent lighter and 14 percent thinner than its 2015 predecessor and feels as premium as ever. The laptop is also thinner than most “pro” Windows laptops with powerful processors. Thinness has become a point of contention, because it makes the laptop more complicated to cool. The unibody aluminum design mates beautifully with the glass display, touchpad, and Touch Bar with Touch-ID sensor. All 15-inch models of the MacBook Pro 2018 also feature the Touch Bar. This is a thin glass touchscreen that runs along the top of the keyboard and displays context-sensitive buttons on its 2,170 x 60 resolution screen. These buttons change depending on the application or task that users are performing, and they are designed to give quick shortcuts to help speed up the workflow. Finishing off with the screen, while it keeps the 2,880 x 1,800 resolution and 220 ppi (pixels per inch) pixel density of previous 15-inch MacBook Pros, it now also features Apple’s True Tone display technology, which debuted on the iPad Pro and also features on the iPhone 8, iPhone 8 Plus and iPhone X. This technology senses the ambient light of the environment users are working in and adjusts the display so that you get a bright and vibrant image, no matter where you are working. Just as on the 2018 13-inch MacBook Pro with Touch Bar, the speakers have been updated. This is an impressive feat, since the MacBook Pro already has the best sounding speakers. As for connectivity, Thunderbolt 3 is a game-changer. Every port has sufficient bandwidth to drive a dock that supports every possible port users could want as well as a high-resolution monitor in addition to power. USB-C is here to stay on the MacBook Pro. More and more laptops are adopting the Thunderbolt/USB-C setup, because it can be used for all kinds of peripherals, from external GPUs to keyboards and mice. Apple chose to include a six-core processor in every model of the 15-inch MacBook, starting with the i7 in the base model, which already has great potential for performance, up to the latest and most powerful i9 model. Moving onto other components, the RAM has been updated from 16 GB of 2133MHz LPDDR3 to 64 GB of 2400MHz DDR4 soldered onto the motherboard. On the graphics side, both the base-model Radeon Pro 555X and top-spec Radeon Pro 560X include 4 GB of video memory. The solid state drive can be configured to a massive 4 TB, thus bringing up the price to around USD10K. The 2018 MacBook Pro reached close to 10 hours before it shut down, which is not a bad figure compared to its rivals. Nevertheless, when working on something more intensive, such as video rendering, one should expect less battery life. AMD Radeon Pro 560X: Mobile graphics card based on the Polaris 21 chip and basically a higher clocked Radeon Pro 560 from the previous model year. With these GPUs you are able to play modern and demanding games fluently at medium detail settings and HD resolution. » Further information can be found in our Comparison of Mobile Graphics Cards and the corresponding Benchmark List. 8850H: On Coffee Lake architecture based processor for big and heavy laptops. Integrates six processor cores clocked at 2.6 - 4.3 GHz (4.1 GHz with 4 cores, 4 GHz with 6 cores) that support HyperThreading. Manufactured in an improved 14nm process (14nm++).» Further information can be found in our Comparison of Mobile Processsors. 80.1%: This rating should be considered to be average. This is because the proportion of notebooks which have a higher rating is approximately equal to the proportion which have a lower rating.